Vuzix on Thursday announced iPhone compatibility for its line of video goggles. The cable costs $40, and will be bundled with Vuzix’s iWear AV230XL product. The AV310WS displays a widescreen video image that's "virtually" like having a 52-inch screen in front of your face. 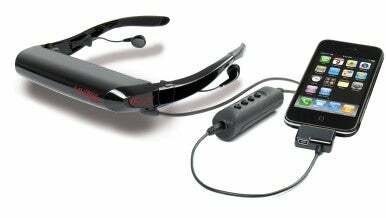 Vuzix goggles enable you to view video privately by wearing a headset that displays the image in front of your eyes. The devices, like other similar products on the market, offer a “simulated” big screen experience, and incorporate earbuds so you can listen to audio. In addition to consumer products, Vuzix manufactures video goggles for the visually impaired, for the medical industry and for military and commercial applications. The AV230XL is a new system that displays a “virtual” 44-inch screen and works up to 17 hours on a removable AA battery. It costs $200. The AV310WS, pictured here, displays a virtual 52-inch screen and sports a 16:9 (widescreen) aspect ratio. It costs $250. Vuzix notes that the “Works with iPhone” cable is the first on the market to support 3D video in Side by Side, Interlaced and Anaglyph 3D modes.